If you’ve spent all morning looking for a dumpster rental, waste no more time on this effort! Discount Dumpster has supplied the Chicago area with trash bins for quite a while. Our roll off dumpsters come backed by our company satisfaction guarantee. If something does not seem right during your rental process don’t hesitate to let us know. Our staff is superior when it comes to taking care of waste management. We are able to service most residential and commercial locations. Call us today to have your dumpster by tomorrow morning. Call us today so we can help determine which bin is best for you. There are many uses for our roll off dumpsters. Whether you have residential or commercial debris to remove, we have the perfect alternative for you. Our dumpsters come in 10, 15, 20, 30, and 40 cubic yard sizes. Call before noon today so our customer service team can offer helpful advice on your waste disposal project. The 10 yard bin is great when you have light spring cleaning. Its compact size allows for the container to fit conveniently on your property. The 10 yard dumpster allows you to dispose of broken glass and unwanted goods. The 20 yard roll off is standard for remodel projects. You can easily transfer wood and other construction debris from your property on your time. The 20 yard can also be used for disposing of landscape debris and household cleanout. Call for an Instant Quote 219-202-6950. The 30 yard dumpster is great for full scale remodels and home renovations. Its relatively large size allows the receptacle to hold construction rubble once you are finished. With 30 cubic yards of space, it is a standard choice for scheduled apartment maintenance. Discount Dumpster knows that not all trash removal situations are the same. We serve residential and construction sites daily. Some of our customers are not sure what materials we can take in our trash dumpsters. We cannot transfer any hazardous or flammable material to any disposal facility. This includes paint, gasoline, battery acid, and freon. We ask that you don’t overload the container because our drivers must comply with a weight limit. Consider Our Rates The Best! Dumpster Rentals For Your Budget. Whether you are removing junk that has been hoarding in the attic or need to remove a lot tonnage from your demolition, the last thing you want is to spend time getting rid of it. This is where Discount Dumpster can help. Our container rentals come in an assortment of options. Let us help you get out that garbage now! What are you waiting for? The garbage has to be removed with no delay. We offer trash dumpsters in 10, 20, and 30 cubic yard sizes. 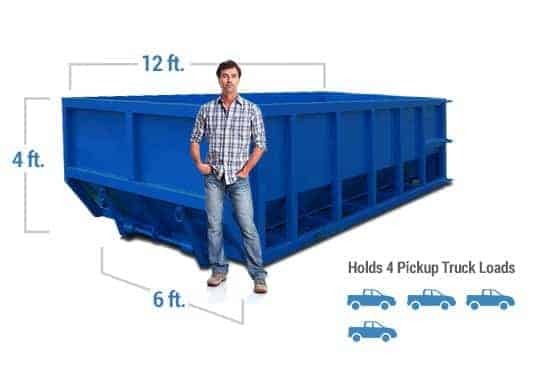 Our roll off dumpsters have the capability of holding up to 15 pickup loads of heavy material. This is great when you only want to toss all your unwanted items in one swoop. Call now before the refuse pile becomes too much to handle. Check your local municipality to understand whether a permit is necessary. We recommend looking at the Gary Building Department to make sure your project is compliant and code issues won’t arise. Also make sure to check with your HOA to ensure that there won’t be any violations that could result in local fines for your construction project. We can’t dispose of items that are prohibited by local landfills. These items include freon appliances, tires, televisions, fuels, oils paints, hazardous materials, for a full list, take a look at our prohibited items resources.